Since its erection in the late 1990s toward the new millennium the London Eye is one of London’s main attractions and is known to the world as the, “World’s Tallest Ferris Wheel”. This amazing observation wheel, referred to by its operators is located on the western end of Jubilee Gardens in the London Borough of Lambeth on the River Thames. The London Eye was designed by architects Frank Anatole, Nic Bailey, Steven Chilton, Malcolm Cook, Mark Sparrowhawk, Julia Barfield and David Marks. One of Europe’s most popular paid attractions that has attracted over 30 million visitors annually and continues to be one of London’s main attractions for the decade. The 443 foot tall ferrris wheel consists of 32 oval shaped pods that represents each borough in London that can hold up to 25 adults. Each capsule is fully air conditioned that gives visitors to either walk around the pod along with seating to accomodate those who would rather sit down. 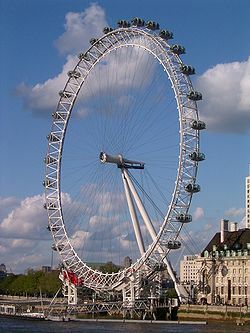 The London Eye resembles an ordinary bicycle tire and a full rotation of the infrastructure takes around 30 minutes to come back around. The London Eye is not only one of London’s many attractions but also a symbol to the city as many of the other countries the 7 wonders of the world reside in. As of January 20, 2011 the world famous London Eye is now known as the EDF Energy London Eye, a part of a three year sponsorship deal. For many more years to come the London Eye will always be a symbol and landmark to the city of London, England along with the rest of the history and landmarks the city has to offer. Be sure to buy tickets online, as during the Olympics there will be very ridiculous long lines. Prices range from 16.74 pounds if purchased online which is a 10% saving. 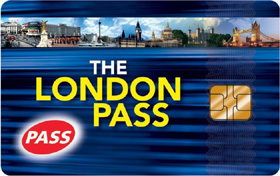 We recommend getting the London Pass so that you get access to museums and other attractions free with the card!